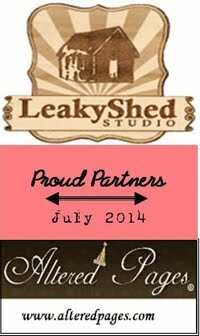 When I began to create this scrapbook layout, I knew immediately that I would be using the "Adorable" Leaky Shed Studio chipboard piece as my title. One look at my "adorable" niece and you can see why...the title fits her perfectly. I love chipboard, and nothing is more fun than taking a blank piece of it and making it my own. For this piece, I used a fun, "new to me" product by Stampendous called Frantage Embossing Enamels. These powders contain a mixture of colors. The one I used here has a combination of white, pink and gold that adds a little touch of bling. If you have never tried embossing powders, I would highly recommend these. They are such a fun and easy way to dress up and add your own personal touch to any of the fabulous chipboard by Leaky Shed Studio. For a complete list of supplies and other details about my layout, please feel free to stop by my blog 17turtles. This is beautiful!! LOVING the colors and the title work!! How pretty! I love the embossing on that cute chipboard and all the fun colors too!